Sometimes things turn out differently than they were planned. Actually that’s usually what happens when it comes to my food photography. Today’s post is a parade example for it.Originally I planned to make a sweet potato pizza dough. It worked pretty fine until I wanted to remove the pizza crust from the baking sheet. I struggled way too much and wanted to safe you the trouble. So the pizza recipe will come another day when I figured out a nicer solution. Originally my second plan was to shoot some really light and springlike photos. And again my photos got that slightly moody, dark look. It’s what I am, I guess – dark and moody. Nevertheless this post has its justification. 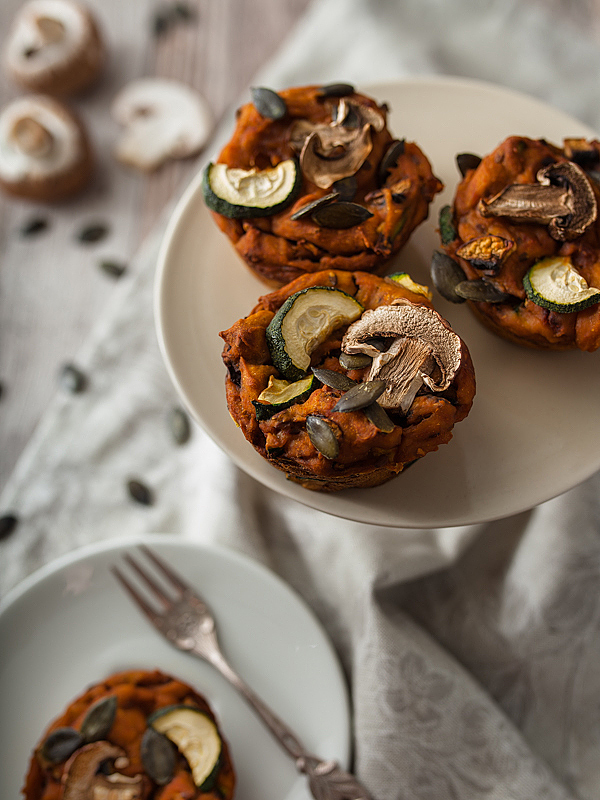 It was high time for a muffin recipe and as I didn’t feel like something sweet and still had this sweet potato idea in my mind I decided to make those savory sweet potato muffins. 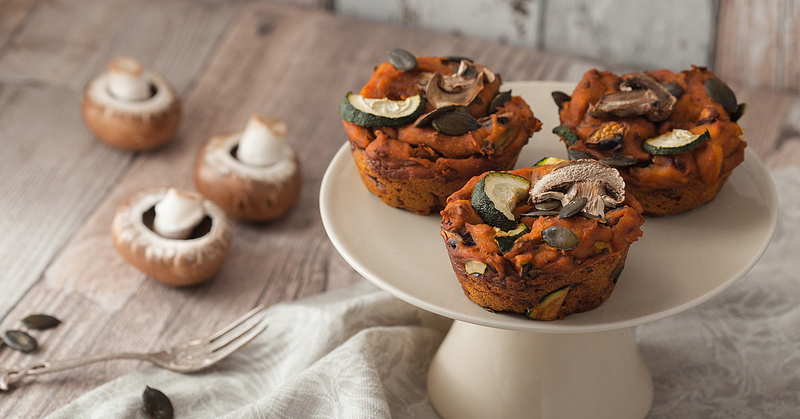 It’s a vegan muffin recipe and consists of boiled and mashed sweet potato, some flour, flax seed as an egg substitute and zucchini and mushrooms as another savory component. The whole deliciousness is further topped with some pumpkin seeds. 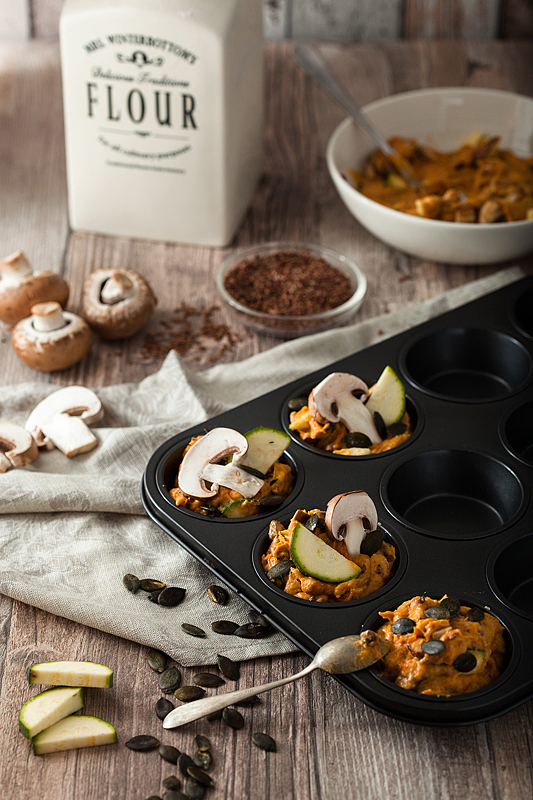 The beautiful thing about these sweet potato muffins is, you can vary it greatly and give it a twist with different vegetables and spices. 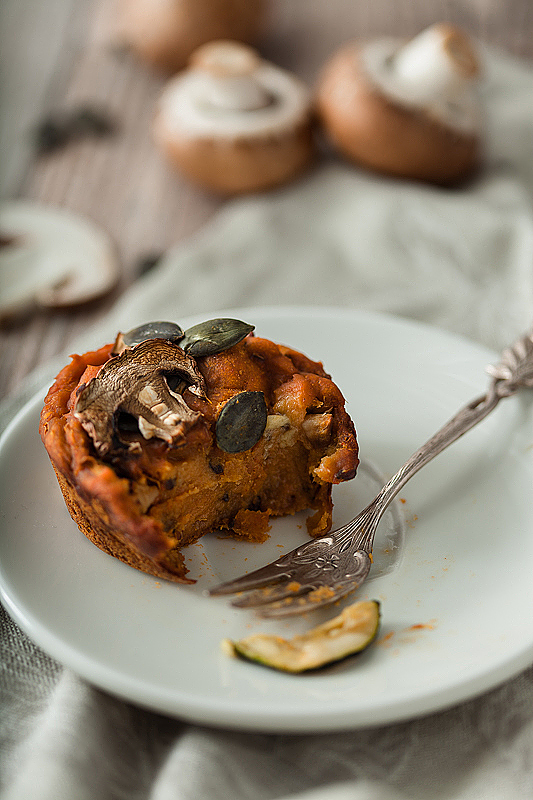 Savory sweet potato muffins are the best when enjoyed fresh from the oven when still warm. Or you warm them up again before eating them later. I still need to mention though, that those muffins will be quite soft and creamy on the inside even if you put them in the oven for 30-40 minutes. They’ll become solid on the outside but the sweet potato will be mushy. I personally liked it, just thought I might need to mention it. Some more information on the flax seed ‘egg’. You simply mix one tablespoon of flaxseed with three tablespoons of water and put it in the fridge for at least 10 minutes. After that you process it like an ordinary egg. As this is my first try with flax seed I can’t give you further information about how it works in other recipes. We’ll go on this journey together 😉 Oh, and chia has similar properties so it’s also utilisable. Peel the sweet potato, dice it and let it boil in a pot of water for 20 minutes until soft. Rinse of the water and mash the sweet potato in a bowl with a fork. Let it cool down for a while. Mix one tablespoon of flax seed with three tablespoons of water and let it sit in the fridge for 10-15 minutes. Place your mashed potatoes on a clean kitchen towel and rinse of all the excess water. 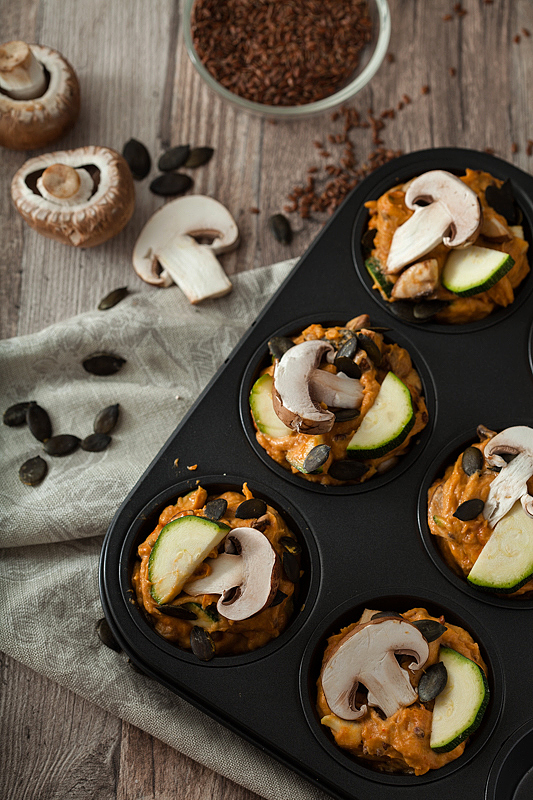 Mix together the flour, baking powder, flax seed egg substitute, sweet potato mass and minced veggies. Grease a muffin pan lightly and fill the dough into the moulds evenly. Garnish with your veggie slices and some pumpkin seeds. Bake for 30-40 minutes until the muffins become a bit darker on top. Absolutely 🙂 I really like your photos and I definitely see a certain style that make them belong to you.